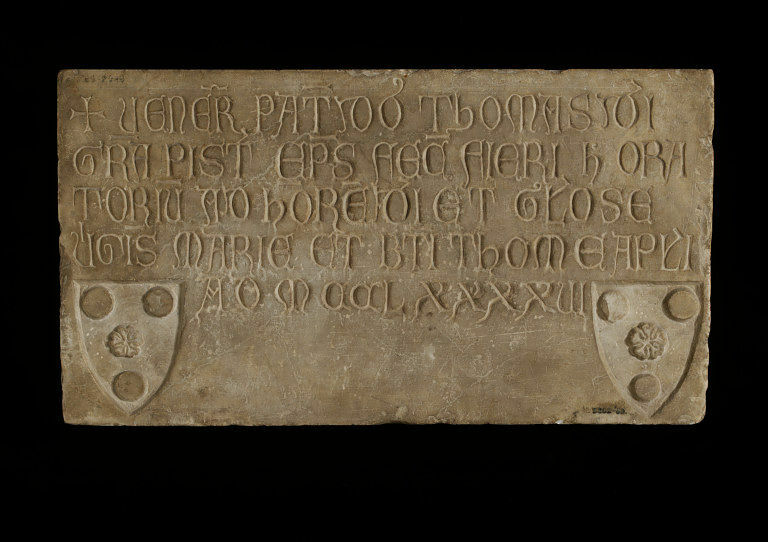 The tablet bears an inscription referring to the foundation in 1296 of an oratory to St Thomas and the Virgin, by Tommaso Andrei, bishop of Pistoia (1285-1303). This was located at his birthplace, Casole d'Elsa, near Siena. Oratories were buildings, separate to churches, that were designated by the church as suitable for prayers and celebrating Mass. This oratory is known to have been no longer in existence by 1833. Andrei was keen on sponsoring building works, and was also responsible for the construction, in Pistoia, of the church of Sta Maria Maddalena (completed 1290) and for the rebuilding of the church of S. Marco. His monument, by Gano da Siena, is in the Collegiata at Casole d'Elsa. 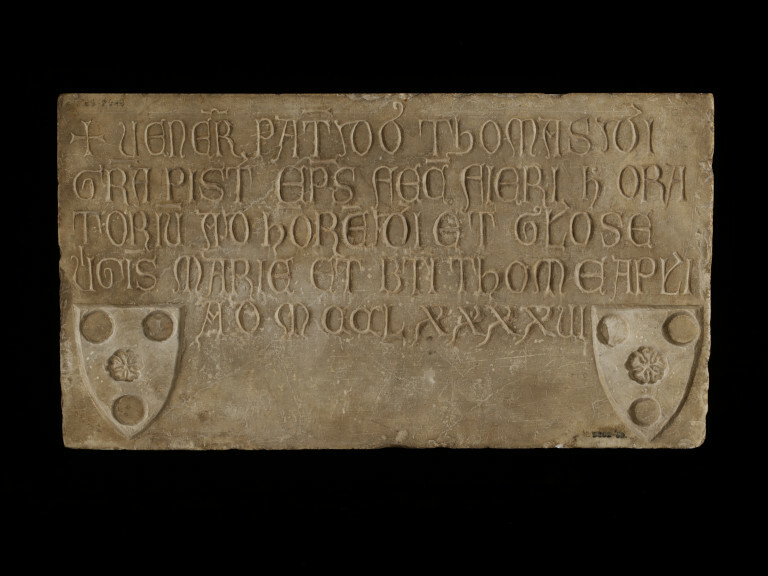 The slab is inscribed, and in the lower corners are two small shields of arms (a cinquefoil between 3 roundels). The tablet was recorded in 1766 (Pope-Hennessy 1964) as preserved in an oratory dedicated to the Virgin and St Thomas in Casole d'Elsa. The oratory is known to have been no longer in existence by 1833. 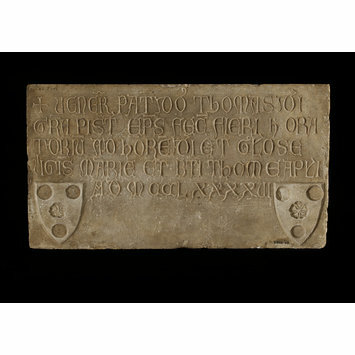 The tablet records the foundation in 1296 of an oratory to St Thomas and the Virgin, by Tommaso Andrei, bishop of Pistoia (1285-1303), at his birthplace, Casole d'Elsa, near Siena. He was keen on building works, being also responsible for the construction, in Pistoia, of the church of Sta Maria Maddalena (completed 1290) and for the rebuilding of the church of S. Marco. His monument, by Gano da Siena, is in the Collegiata at Casole d'Elsa. J. Pope-Hennessy, Catalogue of Italian Sculpture in the Victoria and Albert Museum, London, 1964, vol. I, (cat. no. 14, p.14.